On this morning the wind was blowing with some enthusiasm from the North West. We decided to check out the conditions at Borth Wen, Rhoscolyn, with a view to enjoying the coastline either to the West or East. The sea beyond the bay was lively with white caps due to the antagonistic action of the wind on the flooding tide. We soon decided on an eastwards downwind run to the Cymyran Straits, as this would provide for some nice surfing opportunities and, hopefully, result in an interesting journey. As you approach Cymyran Bay it is worth knowing that the area around this Bay and the straits can become particularly treacherous in the right conditions. These “right” conditions manifest themselves when the Cymyran Straits is ebbing into a strong opposing wind. 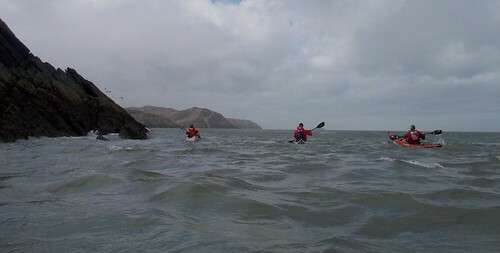 The surf can become huge and respite from this surf, in the lee of the bay’s islets, can be very difficult to maintain due to the strong current sweeping the area. 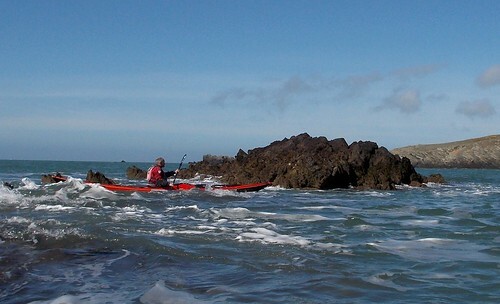 Many vessels have become wrecked in Cymyran Bay, the most famous of which is the “Norman Court”, which ran aground in 1883. This magnificent ship was a tea clipper, of similar design to the “Cutty Sark”. It could sail at great speed, up to 16 knots, and was ideally suited to carrying seasonal products like tea. The first imported teas of a season commanded the greatest prices and inspired the well publicised and popular Great Tea Race events of the 1860’s and 1870’s. Guarding the head of Cymyran Bay is RAF Valley. This busy airbase was constructed on a vast area of sand dunes during the Second World War. The sand posed a challenge to the engineers as it could impede the operation of aircraft. The solution was to stabilise the sand by covering it with peaty material from neighbouring farm land. One such farm, “Yr Ynys”, was tenanted by my grandparents. It included an area of wetland where the livestock could graze in the summertime. The wetland’s centrepiece was a lake that was covered by a vegetated floating mat, of horse tail, that bounced underfoot. The engineers dredged this lake, for peat material, inadvertently revealing 150 impressive bronze and iron votive offerings, gifts to the gods or goddesses. This is the famous Iron Age Llyn Cerrig Bach hoard – a source of much pride to the Roberts family. Moving up the Cymyran Straits it is easy to picture the story of Einir Wyn or Madam Wen and her smuggling ship. According to local legend and immortalised in W.D. Owen’s novel “Madam Wen”, Einir Wyn was a wealthy aristocrat whose family lost their wealth to the Roundheads during the Civil War. To regain her fortune Einir Wyn turned to smuggling and highway robbery. The stronghold of Madam Wen’s gang was the wetland area, including Llyn Cerrig Bach. Madam Wen’s struggle to evade the attention of the authorities and regain her family’s former glory has inspired generations of Welsh readers. The enthusiastic wind had now subsided and backed to become a southerly breeze gently pushing us towards our destination – Four Mile Bridge. 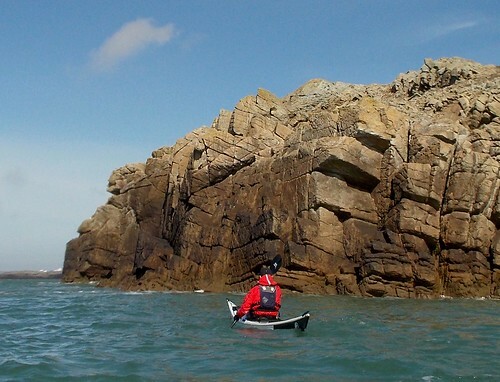 4 April 2015, Rhoscolyn – a sea farers paradise? 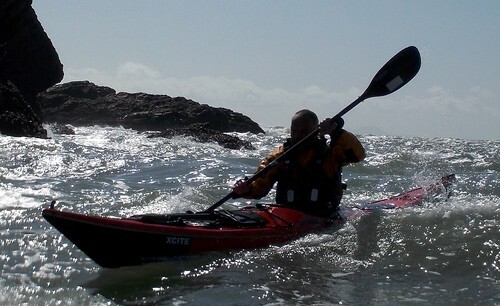 On beautiful summery days Rhoscolyn is indeed a seafarers paradise. 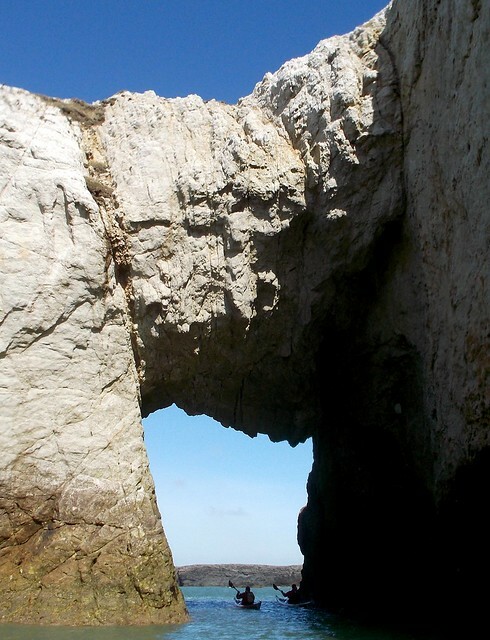 It is one of the finest geological locations for the study of three-dimensional fold geometries. 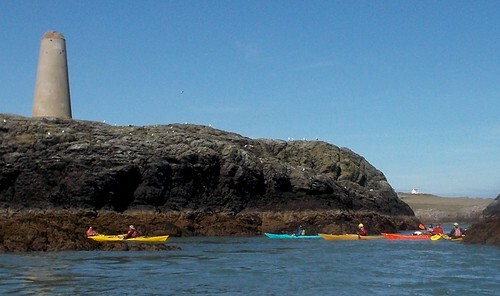 It also harbours a wealth of marine Biodiversity sustained by the clean waters of the Irish Sea. These clean waters are the product of the strong tidal streams flowing, twice daily, to and from the North Atlantic. 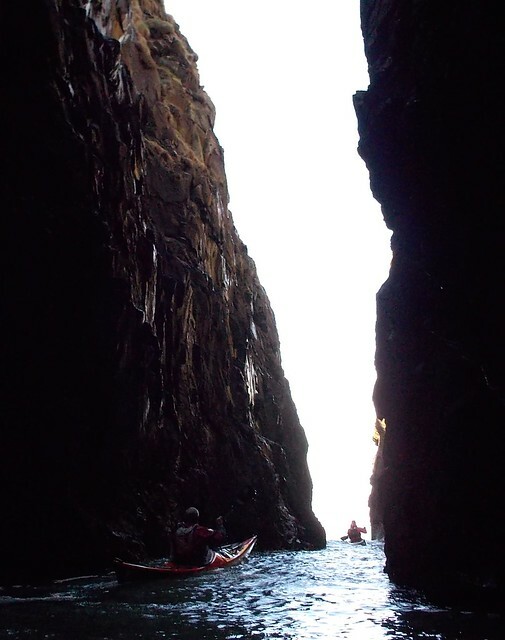 Rhoscolyn is highly exposed to these tidal currents which often provide seafarers with additional energy to propel their vessels on coastal journeys. 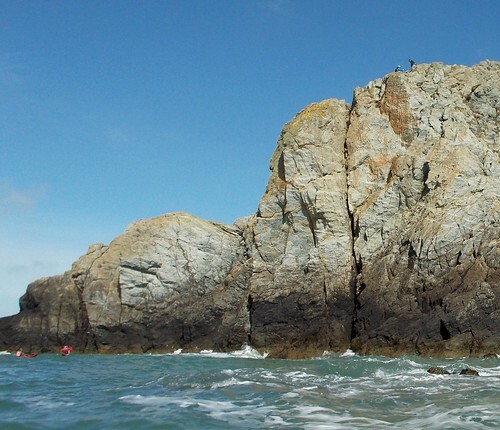 Rhoscolyn is also renowned for it’s rock climbing. 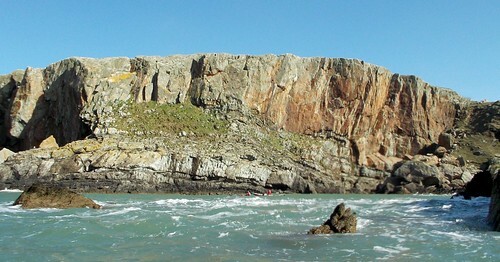 The climbing route known as “Icarus” (HVS, 5a) is the most popular route on the wall at Porth Gwalch. 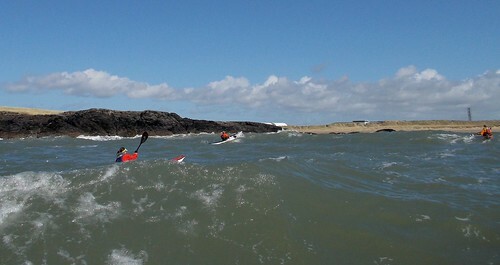 In poor weather the Rhoscolyn area can quickly turn treacherous, often due to the action of the wind on the strong tidal stream. 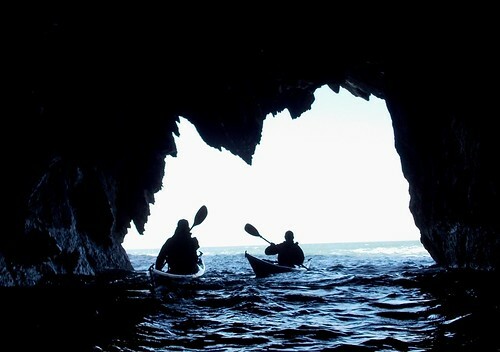 There are a great many examples of seafarers getting into difficulties in these waters. Early in the twentieth century a particularly tragic incident occurred. In December 1920 the “Timbo” steamship got into difficulties on its passage from Liverpool to Ireland. Following a period sheltering gales in Holyhead harbour, the “Timbo” resumed it’s journey westward. On passing South Stack, it was again struck by westerly gales, which pushed the steamship shorewards. 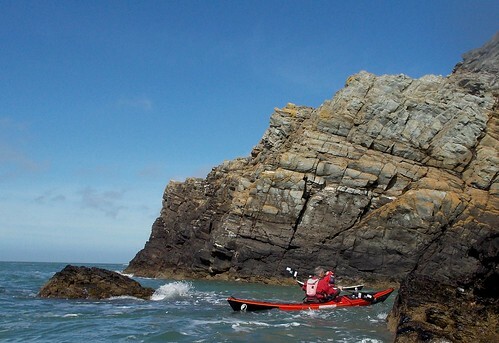 The “Timbo” soon drifted past Rhoscolyn Beacon, whereupon thirteen men in Rhoscolyn’s lifeboat launched and fought for three hours to intercept the steamship. On the fifth attempt a rope was successfully thrown from the lifeboat and attached to the “Timbo”. This success was shortlived and the line was broken. 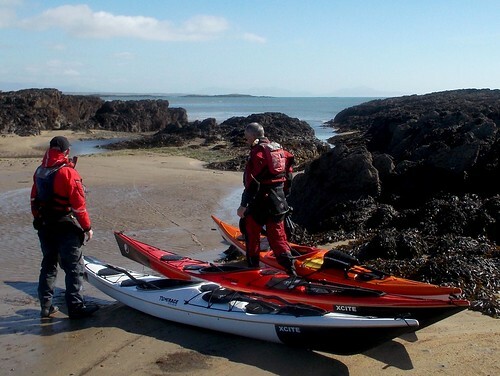 Recognising that the rescue attempt was now turning into a fight for survival, the lifeboat was turned to shore, adjacent to Llanddwyn Island, in a bid to escape the chaos of the sea. Soon after turning a huge wave capsized the lifeboat, throwing the crew into the sea. Five of the Rhoscolyn men lost their lives. Meanwhile, on the “Timbo” five of the crew of eight abandoned ship in their own lifeboat. This small lifeboat also capsized, resulting in the death of four of its crew. The “Timbo” made landfall at Dinas Dinlle beach, sustaining remarkably little damage. It was even eventually refloated and returned to service for a while before becoming shipwrecked on Carreg y Trai reef. near Abersoch. This time all of the crew escaped unharmed. Rhoscolyn Lifeboat Station was disbanded in 1929. Today the local seas are guarded by the National Coastwatch Institute from the old Coastguard lookout. Trearddur Bay Lifeboat is now the closest RNLI base. 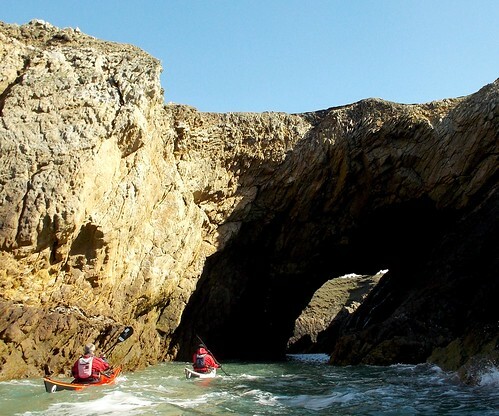 They are both local reminders that the seas around Rhoscolyn can quickly change from being a “sea farers paradise” into a very challenging environment. 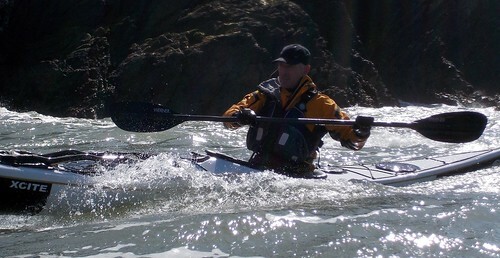 Paddling today were: Richard, Paul and Geth. Saturday, 28 March was a typically windy day on Anglesey, with strong southwesterlies. 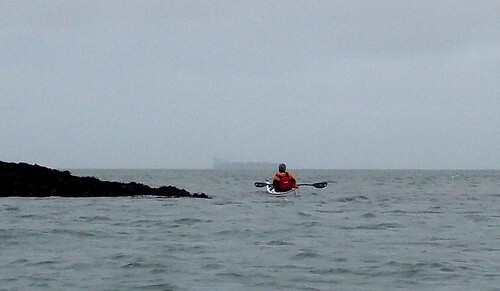 Nevertheless, many sea kayaking groups were out, making the most of the day’s conditions. 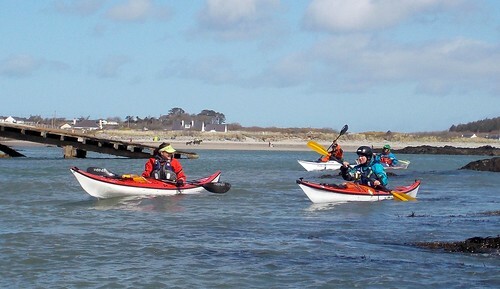 On the West Coast at Trearddur Bay we met Roger Chandler, coaching on an advanced skills course in the lee shore “windward” conditions. 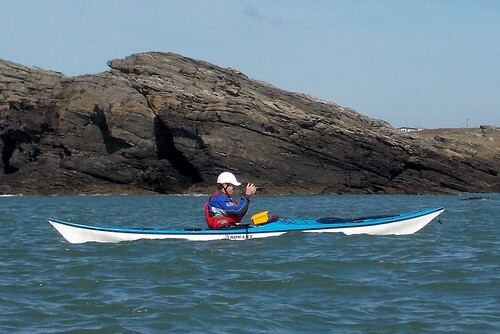 On the North Coast we found Barry Shaw, coaching an introductory sea kayaking session for Sea Kayaking Anglesey. 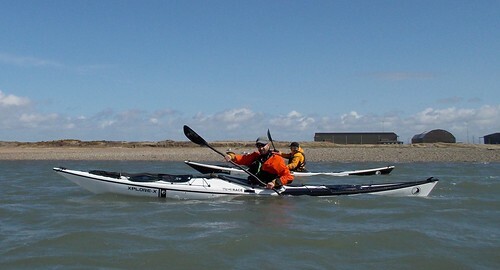 Further along the coast Mark Tozer and Helen Wilson were also sheltering from the wind for their Greenland Style Rolling Course. 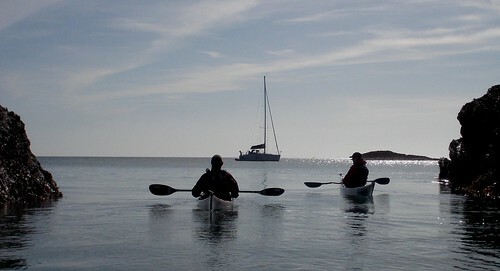 Finally, we also saw Manchester Canoe Club heading to the straits for a skills development fun day. 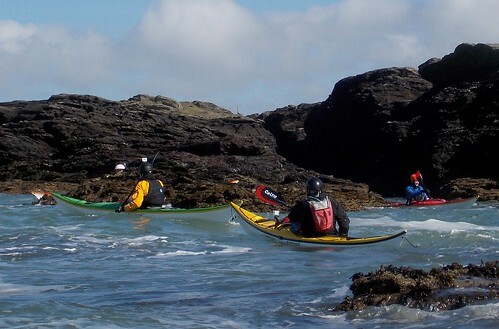 This nicely illustrated how there is usually something for everyone to do sea kayaking along the Anglesey coastline. 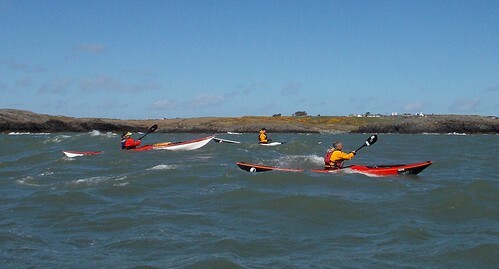 One of our favourite options, on a day like this, is to paddle a returning linear route along the North Anglesey Coast. 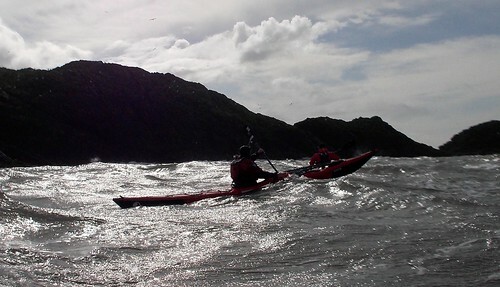 On this particular day we paddled from Porth Llechog, Bull Bay to Ynys Badrig, Middle Mouse and back again. 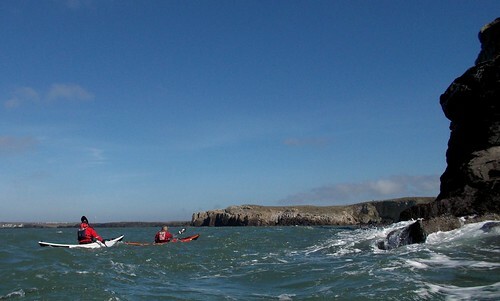 Often, when paddling or walking along the North Coast of Anglesey, you may see very large ships on an Anglesey landward heading. 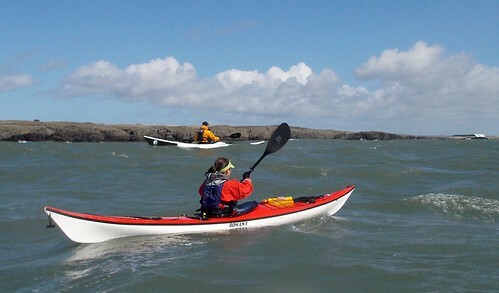 Their objective is to take on board a pilot, from the Anglesey port of Amlwch. These pilots then convey the ships safely onward to Liverpool. 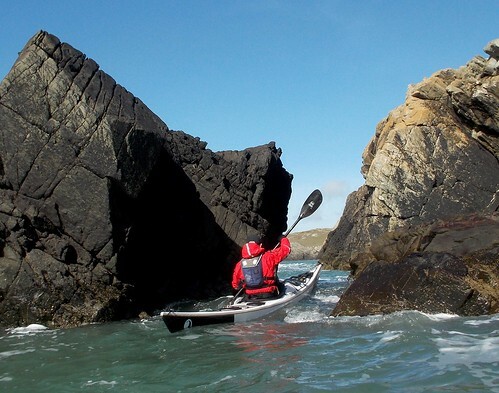 Amlwch has an amazing history as an industrious coastal community. It’s first major industrial activity was to facilitate the export of the copper ore from Parys Mountain. During the 18th and 19th centuries North East Anglesey was the location of the Worlds’ largest copper mines. Anglesey Mining plc intends to re-establish zinc, copper and lead mining at Parys Mountain, when the market price of these metals becomes more favourable. Following the decline of the copper mining industry, a chemical factory, “The Octel” was built at Amlwch in 1953. The Octel’s purpose was to produce bromine and dibromoethane (DBE). 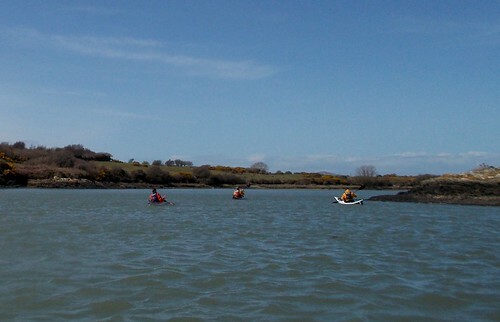 Amlwch was chosen for this site as it has a plentiful supply of very clean, Gulf Stream warmed seawater and was well connected for export utilising the Anglesey Central Railway Line. Dibromoethane was an important constituent of anti-knocking agents needed to allow engines to efficiently use petroleum fuels. The introduction of unleaded petrol in the 1980’s reduced the demand for DBE, resulting in the eventual closure of “The Octel” at Amlwch in 2005. During our journey we encountered Harbour porpoises, Phocoena phocoena, at four locations along the coastline. Our encounters with porpoises are often at the turbulent waters caused by the strong tidal streams. 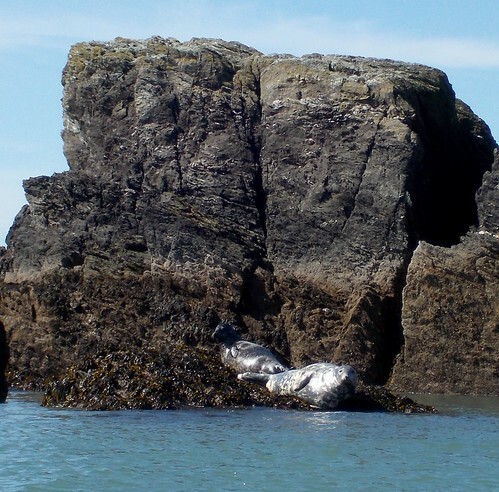 These areas are productive feeding grounds, providing the porpoises with the ~6 kg of food they need each day. Porpoises feed mainly on cod, herring, pollock, mackerel, sardines, and whiting. 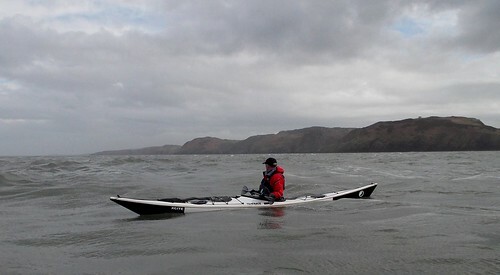 The frequent sightings of porpoises along the coastline of North Wales is a good indicator of fish stocks. 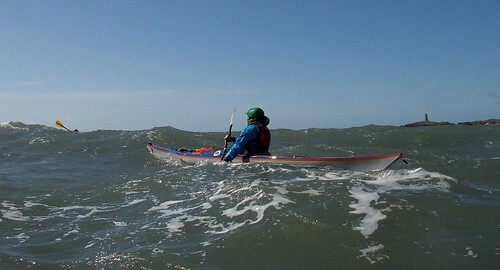 Paddling today were: Richard, Paul, Ed and Geth.